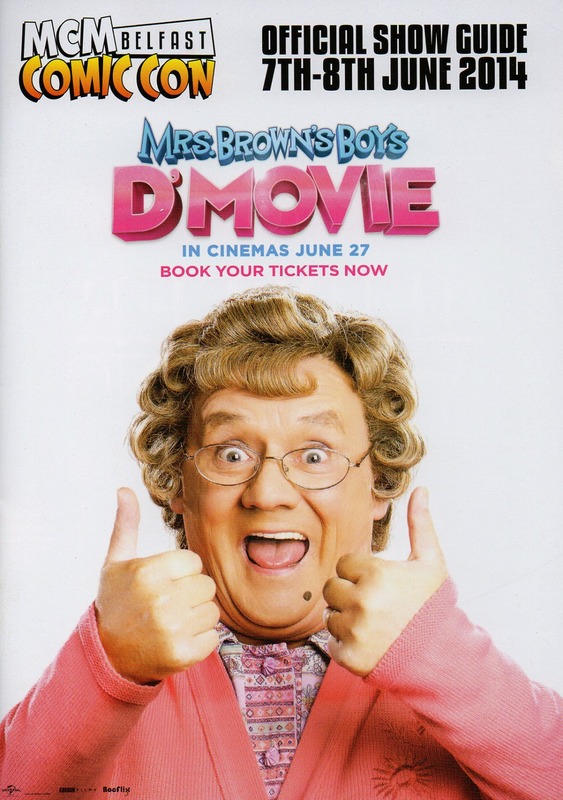 And that image of Mrs Brown on this year's, and the first, MCM Belfast event pretty much sums up everything that I'm about to say. We arrived on Friday, the plan being to spend the morning wandering around Belfast and the afternoon taking our stock to the event location, setting up the table and working out travel arrangements for the next two days. First thing though had to be to take in some of the local ambience ... in the shape of a pint of Guinness. We took a number of opportunities to do this over the long weekend, and the pints went down very nicely indeed. I love Art Deco buildings and Belfast certainly had plenty scattered around the city. As we wandered the streets I realised that I really liked this city. It had everything compressed into a relatively small space, and some great murals dotted around. So, after an enjoyable morning we set off for the King's Hall Pavilion, which is where the event was taking place. We scoped out the bus route, any bus that had a letter following the number 9, but weighed down by suitcases full of comics as well as hand luggage, we did the sensible thing and took a taxi, which wasn't expensive as it turned out. I must confess to being a little disappointed that the event didn't take place in the actual King's Hall, which sadly is unsafe and condemned, but instead took place in a pavilion around the back, but we pretty quickly found ourselves in a large hall full of the usual scenes and sounds as people went about the business of getting their stock ready. ...which felt a little bare without the usual banners, and soon we were sat on a 9a bus heading back into the city centre. The next trick was finding out where to eat, should we sample what a young lady had told us earlier in the day was in fact 'the best burger in town' or try something else ? Could we actually find the place again anyway ? Well, we managed to find it but on closer inspection of the small print found that it didn't serve alcohol. So we headed off and found a nice restaurant in the basement of a building that did a great burger and sold Guinness. Was it anywhere near as good as the best burger in town ? Who could say and how could you prove it anyway ? Saturday saw us get the bus to the venue and we started to get that MCM buzz. There were a few Cosplayers wandering the streets and sitting on the bus. Nothing like the numbers that you get in Manchester or London, but I'm sure that'll change in future events. The queue was forming and again it wasn't the size of other MCM events but as the first of its kind in Belfast it was a good size and encouraging for the days to come. ...and no surprise as Jenika must be the hardest working independent creator in the UK and always seems to do twice as many Cons as we do. The day started in a leisurely way, with a few sales in the first hour and then things picked up. ...and it was pretty constant all day, the odd few minutes of activity followed by a few where it quietened down. The great thing about going to new events is that everybody you meet is new to Accent UK, and so everything on the table is new to them. The Wolfmen sold really well, as if it were just out, and did as well as WesterNoir, which is a new book. 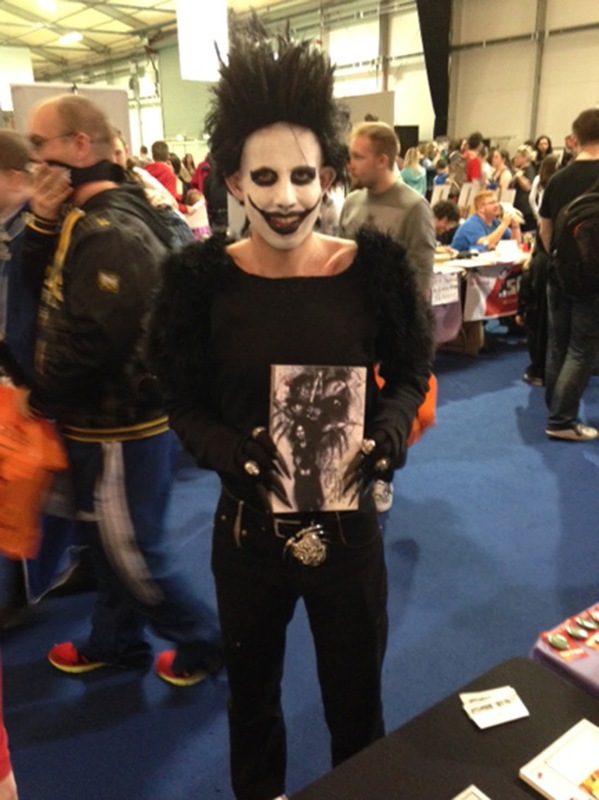 People were genuinely interested in who we were and what we were doing, and we sold a good number of books. ...and numbers were dangerously low on some of the others. The evening was spent with a good friend of ours, Jeremy Briggs, who having been born in Belfast, knew where to eat and took us on a little tour afterwards. If you're ever hungry in Belfast then I'd recommend the Red Panda in The Odyssey Centre, I struggled to eat it all and I'd missed lunch. Jeremy then took us both on a walk around the old docks where The Titanic was built. There's a museum that's dedicated to the ships that were built here..
...with the slogan concerning the Titanic being 'It was fine when it left here'. The next morning we couldn't face breakfast and so headed off to the event quite early, we wanted to do a stock take and re-arrange the table a bit. The buses were pretty prompt and within 30 minutes we were back in the hall. Dave and Colin ... green. 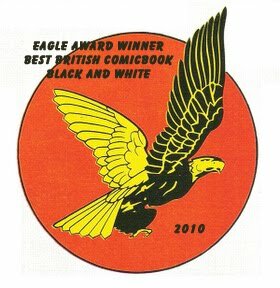 We talked about what would make this a great Con for us, it had already tipped the number of sales that made it a good Con, and wondered if, as is typical at all events, the Sunday would see half the sales of Saturday. Strangely Sunday was almost identical to Saturday, it saw a steady stream of people at the stall, some chatting, some buying but all interested in what we were about. We sold out of a number of titles, and at the end of the day we'd sold pretty much as many books as we had on the Saturday. It had been a great Con. 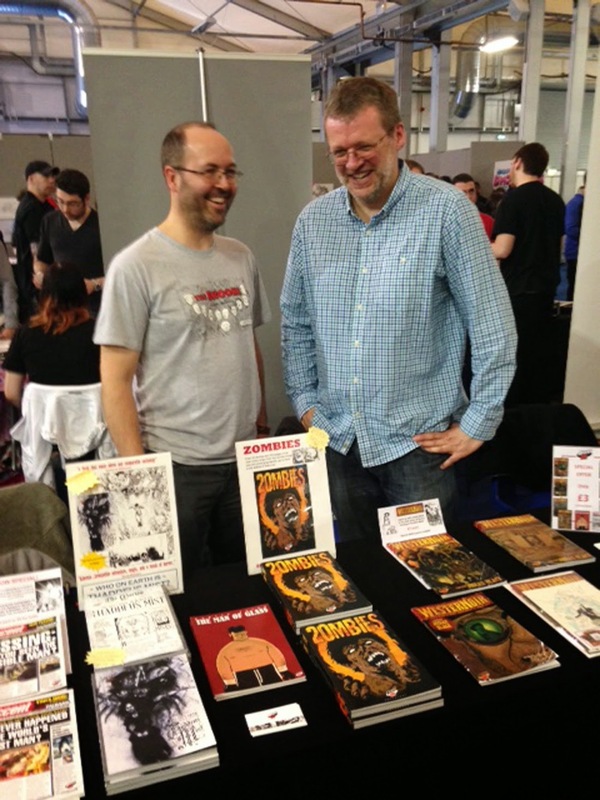 We'd met a lot of really nice people, some of whom had bought books and would hopefully come back for more next year.